We were all up early for an amazing celebration with the entire crew. And, of course, they sang us the Kilimanjaro song. Now, I had been waiting to hear this for, well, a couple of years. So to finally hear it from our entire crew was amazing. Lots of singing and dancing and JOY. Speeches thanking us for giving them jobs, asking us to be ambassadors. Speeches thanking the staff. Speeches saying we're so strong and so brave. And so much singing and joy. Wil and I were of course in tears. Tony told us that he "started to tear up, so looked at you guys ... but that didn't help." I said, "Yeah, when you want stoicism, don't look at Team Wil-Sun." We hugged Hamisi over and over. He had come to our tent in the morning to return my jacket -- we had already decided to offer him Wil's, as Wil didn't need his. So we quietly gave it to him since we wanted him to have it and we didn't really know the protocol. He rolled it up and put it under his arm and left. I know 100% I would not have summited had he not been with us. Then the simple task of a 12-mile, 5.5-hour walk down to the gate to leave the park. We were with Felix, who kept us moving at a good pace. We mainly walked through rainforest, which made for a nice change after the arid climb. We saw some monkeys, but mostly we saw hikers moving up the mountain. A few coming from Mandara Huts, looking perhaps a little shell-shocked on their second day. We reached Mandara Hut -- deserted except for a caretaker at this time of day -- in about two and a half hours. Really happy not to be going back up! After a very short -- 15-minutes -- break, we continued our hike through the forest. Felix was a stern taskmaster. We saw a lot of hikers coming up from the gate on their FIRST DAY. They all looked so clean and shiny! And terrified. I lost the last shreds of my filter and said out loud, on more than one occasion, "You all smell so goooooood" as we passed them on the way up. A few times Felix stopped us to gather our group together -- there were about 12 of us in our clump. For some reason he wanted everyone to stay close, though we never learned why. Animals? Or humans? No idea. Then all of a sudden we went under an archway and realized we were at the gate. A much more formal affair than our starting point! We were a little overwhelmed ... there was a shop! Wil bought a t-shirt and I bought some postcards and wished there was something I really wanted. We signed the climbers' register for the last time. I had taken to listing "Badass" as my profession after Gretchen started listing "Superstar". So I happily signed out. Then we went down to the parking lot and happily took two of the last seats on the first bus -- the plan was to take that bus back to Moshi and feed us at Springlands... whereas the second bus would wait till the last folks came off the mountain and eat at the park. Really pleased to make it on the first bus! The drive back was uneventful, and we pulled into Springlands feeling like conquering heroes. We were all given the same rooms as before -- handy -- so we dropped off our things and made our way into the restaurant. Two words: avocado pizza. And beer. 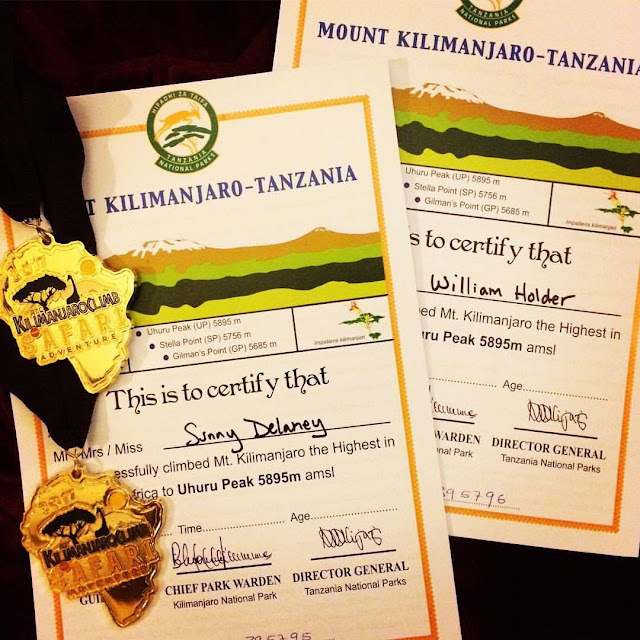 We finally had our first Kilimanjaro Lager. Why, no, we haven't showered in a week, why? After lunch we picked up some water and admired our reflections ... before going to pick up our bags from the storage room (clean clothes!!!) and SHOWERS. HOT SHOWERS. Now, look, we'd kept reasonably clean on the mountain with Shower Pills, but our hair was filthy ... and let's just say there was a lot of dirt going down that drain. In the afternoon we got our bags organized -- essentially sealing off most of our climbing gear, including our boots, sleeping bag, and sleeping pad, in plastic garbage bags within our big duffels, and packing just our safari clothes and toiletries in our little duffel. It was exciting to think about packing lighter for the next couple of weeks! We heard the second bus pull in, so went out to welcome the second shift home. They, too, were torn between beer and showers. We told them to drop off their stuff, turn on their water heater, then have a beer... and *then* have the showers. Then Jenny said a few words, and called us up in ones and twos to get our certificates and, yes, medals. MEDALS. After the ceremony was filed into the restaurant, where I remember little apart from sharing a Kili with Gretchen and then heading off to bed. Tomorrow is -- you guessed it -- another early day as we're headed off on safari!